HSM - What are the main safety hazards on a construction site? Home> Premises >Risk Management >What are the main safety hazards on a construction site? In fact, when it comes to the statistics, a report published by the Health and Safety Executive (HSE), shows the construction industry to be one of the worst performing sectors, with 137 worker fatalities in 2016/17 and work-related illness affecting an estimated 79,000 construction workers (based on average between 2013-2016, HSE). These HSE reports also reveal that, across the number of the fatal injuries per 100,000 workers employed, the rate of fatal injury in construction is around 4 times higher than the rate across all industries and is similar to that seen in mining and quarrying. So what are the main safety hazards on a construction site, which contribute to these alarming statistics and what can site managers do to take positive action to reduce risk? Risks: As buildings go up, the risk of falls from height increases, accounting for 25 worker deaths in 2016/17 and 20% of the 66,000 construction site injuries reported in 2015/16. Construction necessarily involves working at height, inside and outside of buildings and includes working from roofs, scaffolds, ladders including step ladders and equipment such as cradles and cherry pickers. Aside from contributory factors such as freak weather conditions, equipment failure, negligence and accidents, the hazards of working at height can be additionally compounded by restricted mobility and access issues, both of which add to the possibility of fatalities and injuries. Actions to reduce risk: All staff should undertake safety awareness and working at height training, which includes the correct use of PPE, including harnesses and scaffolding. Nominated staff should check equipment regularly for wear, tear and damage and should also monitoring of changing conditions such weather, to avoid increased risk in poor or extreme weather conditions such as wind, rain and ice. Risks: As anyone in the industry knows, construction work isn’t just about buildings going up - often things have to come down, with demolition often being part of development. Phases of work can also include working into or under the ground, with excavation and the creation of trenches and holes, all of which can create a major incident and cause fatalities and injury, in the event of collapse. 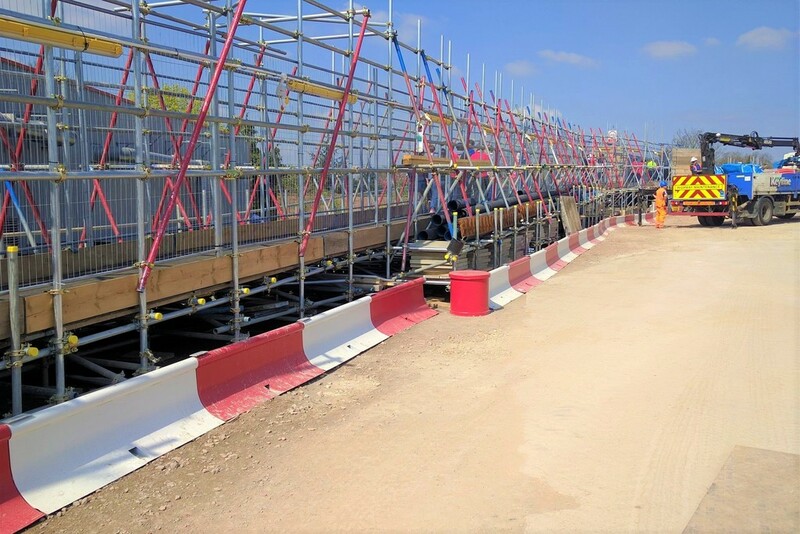 Actions to reduce risk: Regular reassessment of collapse risk throughout phases of work; proper deployment of remedial structures, such as retaining barriers and scaffolding to be regularly checked; clear delineation of risk zones using fit-for-purpose high visibility barrier systems and signage. Risks: Being struck by a moving object is a particular hazard on construction sites and accounted for 20 of the deaths & 11% of the 66,000 construction site injuries reported in 2015/16. Construction sites are, by the nature of their work, extremely busy and constantly changing environments. As buildings are constructed or demolished, heavy plant and vehicles, including cranes working overhead, add to the risk of harm from moving objects. Actions to reduce risk: Full risk assessment across all work phases is vital; hazard zones need to be clearly marked and appropriate barrier systems installed to reduce or confine risk. Further information about construction site risk assessments can be found on the SafeSite Facilities website. Risks: Like agriculture, another high risk industry, work on a construction site necessarily involves vehicles and moving machinery. The latest HSE report shows that the most frequent cause of fatalities amongst workers was being struck by moving vehicles, the cause of 31 deaths. Another similar hazard, contact with moving machinery, accounted for another 8 deaths. Actions to reduce risk: Full risk assessment of vehicular use and safety protocols; designation of traffic management and moving vehicle zones, with use of suitable barrier systems and signage. disorganised work practices, such as plumbing in an area of unfinished electrics. Actions to reduce risk: Thorough risk assessment to include any environmental risks, such as nearby powerlines and cables; systems to ensure that only fully qualified electricians undertake electrical work; good practice in organisation of phases of work and work routines. Risk: Poor manual handling, either as a result of a particular incident or through repetitive movement over time can give rise to the numerous musculoskeletal disorders which account for 64% of the work-related health complaints suffered by construction workers and 22% of the 66,000 injuries in the construction workplace. Overall, over 1.2 million days each year are lost to musculoskeletal disorders. Workers’ bodies are also at risk not just from how they move items, but repeated use of items, particularly machinery and equipment. Conditions such as “blue finger” or Hand Arm Vibration Syndrome can be caused by the repeated use of ground working equipment and vibrating power tools over time and is the cause of many lost hours and liability claims in the construction industry. Actions to reduce risk: Full risk assessment; use of PPE, including lifting equipment; pro-active protocols aimed at reducing risk from prolonged use of such equipment. Adequate training for manual handling should be mandatory for all staff and should include training in the safe use of appropriate lifting equipment. Risk: From materials like asbestos, hazardous when disturbed (for instance during demolition or refurbishment work) to chemicals and materials which are hazardous to use, such as adhesives, solvents, corrosive liquids and paints, as well as the risk of brick and plaster dust, all of which can cause problems to eyes (including blindness), mouths and lungs (including asbestosis, asthma and Chronic Obstructive Pulmonary Disease), every day workers spend on a construction site puts them at risk from harmful materials. Actions to reduce risk: Use of PPE and regular routines to ensure that equipment is (a) fit for purpose (b) used by employees in accordance with safety guidance and the use of specialist knowledge and training; full risk assessment which also takes into account removal, storage and handling of harmful substances; good practice protocols in the event of leaks, spills and accidents of harmful materials. Risk: Construction sites are also extremely noisy environments – from loud machinery such as jackhammers, to less noisy but repetitive sounds such as drilling, construction noise can present not just a short and long-term risk to hearing, but can also be distracting and can mask other sounds such as alarms and safety warnings. Actions to reduce risk: Use of PPE which needs to be checked regularly; separate noise risk assessment may also be needed and can include risks to passers by, such as the general public or neighbouring properties and businesses. Risks: As well as falls from height, slips, trips and falls accounted for 23% of construction sector workplace injuries in 2014-15 and risks arise largely because the majority of construction sites involve uneven terrain and temporary surfaces. Additional falling, tripping and slipping risks arising from damage, holes and risk of wet patches, for instance from the weather and use of liquids. Actions to reduce risk: Measures need to be in place for checking stability of ground; introduction of protocols for speedy removal of spillages and working in wet weather. Whilst actions to reduce risk are suggested, none of these are exhaustive or are intended to replace the need for a full risk assessment to identify (and then take steps to minimise) risk to all who have the potential to be harmed. Training employees is particularly important in risk minimisation and should always be extended to subcontractors and temporary staff. Records of training should always be kept as a matter of priority and refresher training and updates offered regularly. Finally, the HSE reports that, in 2016/17, 92 members of the public were killed as a result of construction industry accidents. As the majority of construction sites are in public areas and involve visitors to the site, no construction site risk assessment is complete without full assessment of public safety. This information is offered by SafeSite Facilities and is intended for guidance only.